With their electrifying fifth album HELIX due out October 19 through Spinefarm Records and armed with new singer Nils Molin, the almighty AMARANTHE are taking another leap forward in their sonic evolution. The band has dropped the video for the new single "Countdown". Watch the video, directed by longtime collaborator Patric Ullaeus, on KNAC.COM HERE. "As the days and weeks are getting closer to the release of HELIX, what better way to illustrate our excitement and veritable impatience than by releasing our second single titled "Countdown"?," asked AMARANTHE guitarist and composer Olof Mörck. "Drawing upon a darker theme and subject matter than your typical AMARANTHE song, the sonic landscape itself forms a perfect counterpoint to this more serious side of the band. The contrasts have perhaps never been stronger, the ambitions never higher, and confidence never more solid - AMARANTHE in 2018 in its purest, most distilled form is "Countdown"." 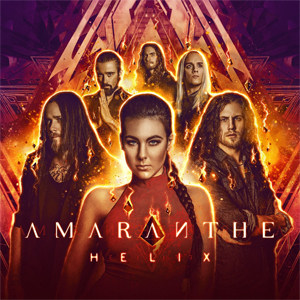 Four albums into their career, AMARANTHE have racked up north of 118 million YouTube views and half-a-billion song streams, have landed at #1 on the Billboard Heatseekers Chart three times, and possess a panoply of gold and platinum discs for albums and singles alike. HELIX proves the band has refined its melodic sensibilities ever further while retaining a cutting-edge metal assault. The video and single for "Countdown" once again showcase the band's unique musical sound and vision. Fans can stream and download "Countdown" HERE.